Grassroots has a tremendous staff led by top Trainer Troy Jones of TZ Sports on the far left in the white hat. In additioin, we have an awesome staff of High School Coaches that is ever expanding. But what you are paying for is our staff of seasoned NFL veterans that come out to Show the skills that helped them pay the bills. 4th From the left is 6 Year NFL Vet Jason Murphy on the OL (Titans); 6th from the left is 9 Year NFL Vet Lamont Jordan on the RB's (Jets); Arm around him is 12 Year NFL Vet Richie Anderson on the WR's; Next to him is current NFL DB Ricardo Silva of the LIons; 2nd from the end is 12 Year NFL Vet and GYFL VP JB Brown on the DB's, and last but not least is 6 Year CFL Vet Marvin Graves on the QB's. What are you waiting for? Looking for more exposure for your HS Athlete? No Offers yet? Getting a little concerned that he may be slipping through the cracks? Learn the techniques that will help him stand out from the competition that is desparately fighting for the elusive college Scholarship. The reality is that we average 60 Division 1 Scholarship offers from the DMV each year........ That is it! There are an average of 16,100 High School athletes in the region every year and only 3% are going to D-1 Colleges on scholarship. We MUST Change that and we must start now!!!!! It always has and always will be a joint effort between the High Schools and Grassroots. Some of you are in strong High Schools with coaches with connections and influence. They will do their part. Combining a strong High School staff with a Grassroots influence gives you the best opportunity to happy on Signing Day when your senior year comes. There are on guarantees and we don't make any. Other than we guarantee we will provide the platform, the exposure, and the opportunity for you to show what you can do to people that matter. We will do our very best to maximize your chances, but you need to be there. Why do you think we work soooo hard at Grassroots to get the kids on the map at younger and younger ages. While many of the better 11th graders in the area are still looking for their first scholarship offer, we have Grassroots alums in the 9th Grade with multiple BCS offers. Something is in the mix here. Trust me, we are connected with the people that matter and that can get your son noticed and get him ranked, but in order for us to put our reputation on the line, we have to see him ourselves. There has been a major void created in the HS showcase market this year. Over the past 3 or 4 years, MDHigh.com has produced outstanding showcases that were heavily attended and heavily scouted by Rivals, 24/7 and the like. Those showcases are no longer around. We used to refer our alums to those showcases for them to get noticed and it was effective, but since they are no longer around, somebody had to step into the gap.......... Who better than us? Grassroots coaches and personnel are scouts for Football University and the US Army All American Game, just to name a couple. We are partners with the Chesapeake Bowl and Crab Bowl organizers. We have the best and strongest HS and college connections in the region, so it only made sense that we would step into this arena for the sake of our alumni who we live for. Our former NFL players, collegiate stars, HS coaches and trainers provide hands-on instructions and teach your player the same techniques that have molded some of the best football players in the country. Grassroots HS Showcases provide tremendous exposure for athletes interested in developing their talent as well as an opportunity to gain exposure to top colleges and universities. The showcase events provide a platform for athletes to be ranked by top scouting services. Rivals.com will be on hand to evaluate. Initially, the events were only going to be for Grassroots Alums, but we decided that because we love all of our kids from DMV and want to see them all have an opportunity, we will open the opportunity up for all HS football players in the region. Grassroots Alums will get priority spots if we sell out each camp. We have no interest in becoming a meat market to make money. We will max each camp out at 100 kids, so you need to register early. Finally, our showcase events will measure athlethic potential, provide valuable feedback, training guidance and on-field skills development for each athlete as they strive towards the next level of performance. There will be no HS showcases in the region quite like the ones Grassroots will provide, but you have to sign up now before spots run out. 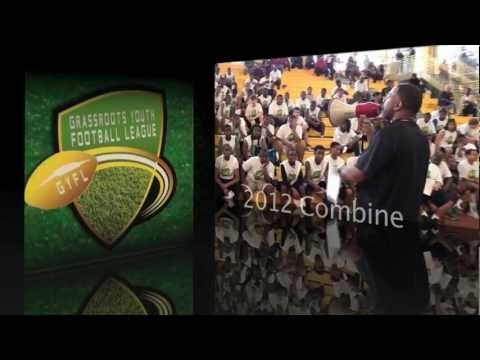 12 Year NFL veteran JB Brown, 11 Year NFL vetaran Chad Scott, 9 Year NFL veteran Lamont Jordan, 12 Veteran Richie Anderson, 8 Year Veteran Lavar Arrington, 6 Year Veteran Jason Murphy, current NFL Star Ricardo Silva of the Detroit Lions, and a host of other elite former college players and HS coaches from the area will oversee and demonstrate the techniques that made them local legends. Scouts will produce write ups and top performance lists that will be posted on the web and sent to college coaches accross the country. Our website gets 1Million hits per month and the decision makers from colleges and universities will be reviewing. Not only have we been able to develop strong high school and college relationships, but because of our success, we have relationships with all of the top scouting services. Invitations to scouts from Rivals, Scout, 24/7, ESPN 150, Max Preps, and the hot new service SigningDay will go out. The results from these performances WILL get into the hands of the folks that can make a difference. More importanly, the invitations to some of the most exclusive Showcases, Camps, and combines will be given to those who perform well and stand out. We have exclusive invites to the VTO Sports Showcases, the Under Armour/Rivals Showcases, and yes, even the NFL Prep 100 Series, which is so exclusive that most of you don't even know it exists. The NFL will be at the Baltimore Ravens Practice Facility on April 6th and 7th and have partnered with us to deliver exclusive invites. We will be looking for talent at our final Easter Sunday Showcase to find players to invite to this once in a lifetime opportunity. Please click the Link to read up on NFL Prep 100 if you need any further motivation to get signed up. There is nothing quite like the access that we can provide for your child at whatever level he is ready for, and we will provide those oppotunities. Be it the Football University Camp, the USA Football Camp, the VTO Sports Combine, and all the other events leading up to the NFL Prep 100, Grassroots is your one stop shop from 7 years of age to 18! What are you waiting for? We even lowered the price for you. But there will be no more than 100 slots, so we suggest you move quickly!!!! Note: Online registration will Close at 11:59 pm on the previous Friday Night for the Sunday Showcases. 2:00-2:30 intro to event etc. Click Here to register for the career making event!